The physical and chemical properties of Moringa stenopetala (Haleko) seeds produced in Mella district of Gamo Gofa Zone in southern Ethiopia are reported here for the first time. The average weight of the whole intact seeds (g/100 seeds), the kernel (g/100 seeds) and an individual seed (g seed-1) was 73.6, 59.6 and 0.6 g, respectively. The kernel accounted for 79.7% of the seeds dry weight and the hull accounted for 20.3%. The M. stenopetala seeds analyzed had an average length, width and bulk density of 17.6 mm, 8.2 mm and 0.9 g cm3, respectively. The mean moisture, oil, protein, ash and crude fiber contents of the M. stenopetala seeds analyzed were 6.1, 41.4, 42.6, 4.6 and 5.1 (g/100 g), respectively. The residue that remained after oil extraction of the seeds had an average crude protein content of 55.6 (g/100 g). The results showed that M. stenopetala seed contains high oil and protein contents suggesting that it could be used as important source of oil and protein. Eyassu Seifu , 2012. Physicochemical Properties of Moringa stenopetala (Haleko) Seeds. Journal of Biological Sciences, 12: 197-201. Moringa is a tropical plant belonging to the family Moringaceae and grows throughout the tropics. The genus Moringa consists of 13 species (NRC, 2006) of which only Moringa oleifera has been accorded research and development attention. M. oleifera is native to sub-Himalayan tracts of northern India and is commonly referred to as horseradish tree or drumstick tree (Jahn, 1991). Moringa is a multipurpose tree of significant economic importance as it has vital nutritional, industrial and medicinal applications (Jahn, 1991; NRC, 2006; Paliwal et al., 2011). The rest species of Moringa, on the other hand, have not been studied in detail and their potential uses have not been full understood. Moringa stenopetala was domesticated in East African lowlands and indigenous to southern Ethiopia. Many different ecotypes and varieties of M. stenopetala are found in Ethiopia. M. stenopetala is often called cabbage tree and is an important indigenous vegetable in south western Ethiopia where it is cultivated as a food crop. Its leaves are consumed by Gofa, Konso, Burji and Gamo tribes as vegetable especially during the dry season (Jahn, 1991; Abuye et al., 2003; Yisehak et al., 2011). M. stenopetala is native to Ethiopia and it is known by various vernacular names. It is called Haleko in Gofa areas, Shelagda in the Konso language and Shiferaw in Amharic (Jahn, 1991). M. stenopetala is particularly important as human food because the leaves, which have high nutritional value (Abuye et al., 2003), appear towards the end of the dry season when few other sources of green vegetables are available. Haleko leaves contain high contents of essential amino acids and vitamins A and C (Abuye et al., 2003). The seeds of M. stenopetala contain edible oil that can be used for cooking and as salad dressings (Lalas et al., 2003; Lalas et al., 2006). Besides, M. stenopetala seeds have traditionally been used to purify turbid water in many tropical countries (Sutherland et al., 1989; Mayer and Stelz, 1993) like its Asian counterpart Moringa oleifera (Fahmi et al., 2011). It was reported that M. stenopetala seeds have better water purifying properties than M. oleifera seeds (Mayer and Stelz, 1993). Crude extracts from the defatted seeds reported to exhibit antimicrobial effects (Eilert et al., 1981) and thus could be used to preserve different food and non-food ingredients. M. stenopetala is a fast growing tree well adapted to semi-arid areas. It is quite drought tolerant and can grow at altitudes ranging from 390 to 2,200 m above sea level, annual temperature ranging from 24-30°C and annual rainfall ranging from 250-1400 mm (Mayer and Stelz, 1993). Although there is some information on the composition of the seed and seed oil, there is no information on the physical properties of M. stenopetala seeds so far. Physical properties of seeds are needed for the design of equipment that is used to handle, transport, process and store and for assessing product quality (Shkelqim et al., 2008). Research reports indicated that there is a considerable interprovenance variation in the composition of M. oleifera seeds grown in different agro-ecologies (Anwar et al., 2005). Thus, the composition and quality of M. stenopetala seed grown in southern Ethiopia could be different from values reported for seeds of the same species from elsewhere. Therefore, understanding the physical and chemical properties of M. stenopetala seed is important and would help to develop a method or apparatus that could be used to effectively process the seeds at commercial level and to exploit the potential uses of the seeds. Moringa stenopetala seeds: A total of 12 kg dry Haleko seed samples were obtained from farmers in Mella Naha district of Gamo Gofa Zone in southern Ethiopia. The area is known for growing the cabbage tree called Haleko and its leaves are used as staple vegetable by the people in the area. The seeds were separated from the pods and delivered to Haramaya University Animal Nutrition Laboratory and stored at room temperature until analysis. 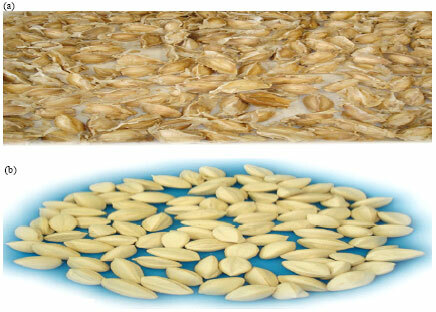 Physical properties: Dry seeds were analyzed for seed weight, kernel weight, bulk density, volume, length and width. Immediately before analysis, the shells (seed coats) were removed manually and the physico-chemical properties of the seeds and kernels were determined. Hundred seed mass: One hundred seed mass was determined by using 100 randomly selected seeds and weighing the seeds using a digital electronic balance with 0.0001 g sensitivity. Results were expressed as mean of duplicate determinations for each sample. Length and width: The average length and width of the seeds were determined based on 100 randomly selected seeds. Careful visual observation revealed that dehulled M. stenopetala seed has oval shape and its thickness decreases from the highest point at the center towards either end of the seed. Thus, the width of the seeds was measured at the thickest point at the center. The width and length of the seeds were measured using a digital caliper (Model Blue/05.00/S 225) with an accuracy of 0.01 mm. Bulk density: The bulk density of the seeds was determined according to the procedure of Bishnoi and Khetarpual (1993). Seeds (100) were weighed accurately and transferred to a measuring cylinder of known volume, where 100 mL distilled water was added. Seed volume (mL/100 g seeds) was obtained after subtracting 100 mL from the total volume (mL) attained after adding the seeds. Volume increase was measured immediately in order to avoid swelling of the seeds. The bulk density of seeds was calculated by dividing the average weight of the kernel (100 seeds) by its volume and is expressed as g mL-1. Proximate composition: The proximate composition of the seed samples was determined by the American Official Analytical Chemists method. The oil content of the seeds was determined by method 948.22, the crude protein content (%N x 6.25) by method 950.48, the moisture content (on dry matter basis) by method 925.40, the ash content by method 950.49 and the crude fiber content by method 935.53 of AOAC (1995). Statistical analysis: The physical and chemical composition data of the seed samples were analyzed by descriptive statistics using SPSS program, version 12.0. Minimum, maximum and mean values were calculated for each variable. The physical property of M. stenopetala seeds used in this study is indicated in Table 1. Physical properties such as size, shape and bulk density and chemical composition of seeds are needed for the design of equipment to handle, transport, process and store and for assessing product quality (Dunford, 2008; Shkelqim et al., 2008). Moreover, unit operations for preparation of seeds for oil extraction vary slightly depending on the physical properties and oil content of the seed (Dunford, 2008). Undehulled M. stenopetala seeds examined are triangular, have three wings and covered with a spongy thick yellowish seed coat (Fig. 1a). The kernel has whitish grey color and oval shape and its thickness decreases from the center towards either end along the length of the seed (Fig. 1b). It was reported that a single 4-13 years old M. stenopetala tree can produce up to 4500-10000 seeds that weighs 2.3-5 kg from about 500-1000 pods (EIAR, 2003). The same report indicated that 1 kg of seed contains about 1795-2078 seeds. M. stenopetala seeds are reported to be larger than the seeds of M. oleifera (Mayer and Stelz, 1993; NRC, 2006). The average weight of undehulled seeds (g/100 seeds) observed in the current study is much higher than that reported (29.9 to 30.2 g/100 seeds) for Moringa oleifera seeds (Foidl et al., 2001). The average weight of the kernel (59.6 g/100 seeds) of M. stenopetala seeds observed in current study is more than double to the values reported (21.2-22.5 g/100 seeds) for M. oleifera seeds (Foidl et al., 2001). The kernel to hull ratio and the average weight per seed of M. stenopetala seeds used in this study were 0.6 g and 79.7: 20.3, respectively. The Ethiopian Institute of Agricultural Research (EIAR, 2003) reported an average weight of a single M. stenopetala seed to be 0.5 g.
Research findings indicated an average weight per seed of 0.3 g and kernel to hull ratio of 75: 25 for M. oleifera (Foidl et al., 2001). The amount of hull on oilseeds varies significantly. The percentage of hull for cotton seed, sunflower seeds and soybean are 45, 25 and 7%, respectively (Dunford, 2008). The amount and type of hull can determine the design of dehulling equipment and oil production efficiency. Most oilseeds are reduced in size to facilitate hull removal, heating, drying and flaking prior to oil extraction (Dunford, 2008). Thus, seed size can influence the design of cracking or flaking mills used for seed size reduction. The gross composition of M. stenopetala seeds used in this study is indicated in Table 2. The moisture content of oilseeds can determine the storage condition and influence the duration of storage and subsequently the quality of the oil and meal (Dunford, 2008). The moisture content of oilseeds often needs to be reduced to 10% to minimize degradation during storage and to improve the effectiveness of downstream processing (Dunford, 2008). Whole, intact, low-moisture oilseeds (about 8-10% moisture) can be stored for an extended time without significant change on the quality of the oil (Dunford, 2008). High moisture content (above 14-15% moisture) in seeds has an adverse effect on oil and meal quality (Dunford, 2008). M. stenopetala seed samples analyzed in this study had average moisture content (on DM basis) of 6.1 g/100 g. This value is comparable to the corresponding values reported (5.70 g/100 g) for Moringa oleifera seeds (Anwar and Bhanger, 2003) and M. concanensis seeds (5.88 g/100 g) (Manzoor et al., 2007). The moisture content obtained in the present study suggests that Haleko seeds may not need drying before processing if stored under appropriate conditions. The average fat content of Haleko seeds observed in the present study is higher than 33.6 and 27.5 g/100 g fat reported for the common oilseeds flax seed and safflower seed, respectively (Bozan and Temelli, 2008). The seeds of the other Moringa species especially M. oleifera have been used to produce specialty oil. Moringa oleifera and M. concanensis seeds contain 40.39 g/100 g (Anwar and Bhanger, 2003) and 38.82 g/100 g fat (Manzoor et al., 2007), respectively. Thus, it seems that Haleko seeds produced in Mella district have good potential for oil production and hence need due attention by all concerned. Research findings from Malawi indicated that cooking oil with unique characteristics and good sensory quality can be extracted from M. stenopetala seeds (Lalas et al., 2003, 2006). Similarly, reports indicate that M. oleifera seed oil can be used for cooking, in salad dressings and in the manufacture of perfumes and cosmetics (Jahn et al., 1986). Thus, it can be expected that M. stenopetala seed could have its own unique properties and possibly be used for similar purposes; however, this needs to be verified by further study. Aslam et al. (2005) reported that the composition especially the mineral content of M. oleifera produced in different agro-climatic regions of Punjab, Pakistan significantly varied from region to region. The average protein content of Haleko seeds observed in the present study is higher than 33.25 g/100 g reported for M. oleifera seeds grown in Brazil (Oliveira et al., 1999), 30.1 g/100 g reported for M. concanensis seeds grown in Pakistan (Manzoor et al., 2007) and 22.1 g/100 g reported for M. peregrina seeds grown in Saudi Arabia (Somali et al., 1984). The Haleko seed meal that was obtained after fat extraction had higher protein content (55.6 g/100 g). This suggests that Haleko seed meal could be used as an important protein supplement in animal feeds as is the case with its close relative M. oleifera seed meal (Foidl et al., 2001). Owing to the high protein and lipid contents in the seeds of M. oleifera, Anhwange et al. (2004) suggested that it could serve as supplementary source of essential nutrients to man and animals. The average ash content of Haleko seeds analyzed in the present study is higher than 4.43 g/100 g reported for M. oleifera seeds from Brazil (Oliveira et al., 1999) and 2.5 g/100 g reported for M. peregrina seeds from Saudi Arabia (Somali et al., 1984); however, it is less than 9.0 g/100 g reported for M. concanensis seeds from Pakistan (Manzoor et al., 2007). Moreover, the ash content of Haleko seeds obtained in this study is higher than the values 3.8, 3.4 and 3.9 g/100 g reported for the common oilseed crops groundnut (Atasie et al., 2009), dehulled Niger seeds (Bhagya and Shamanthaka Sastry, 2003) and flax seed (Bozan and Temelli, 2008), respectively. The high ash content observed suggests that M. stenopetala seeds may contain essential mineral elements; however, this needs further investigation. On the other hand, the crude fiber content of Haleko seeds observed in this study is less than 7.2 g/100 g reported for M. oleifera seed (Anwar and Bhanger, 2003) and 6.0 g/100 g reported for M. concanensis seeds (Manzoor et al., 2007); however, it is higher than that reported (3.6 g/100 g) for M. peregrina seeds (Somali et al., 1984). Dietary fiber plays a very important role in maintaining good health (Anderson and Bridges, 1988). The high crude fiber content of M. stenopetala seed analyzed suggests that it could serve as an important source of dietary fiber. The current study revealed the composition and physical properties of seeds of Moringa stenopetala variety produced in Mella district of Gamo Gofa Zone in southern Ethiopia. The high oil and protein contents of M. stenopetala seeds suggest that it could serve as a source of oil and the seed meal could be used as an important protein supplement in animal feeds. The assistance of Mr. Belay Balla during collection of the Haleko seed samples is highly appreciated. AOAC., 1995. Official Methods of Analysis of the Association of Official Analytical Chemistry. 16th Edn., AOAC International, Washington, USA., Pages: 1141. Abuye, C., K. Urga, H. Knapp, D. Selmar, A.M. Omwega, J.K. Imungi and P. Winterhalter, 2003. A compositional study of Moringa stenopetala leaves. East Afr. Med. J., 80: 247-252. Anderson, J.W. and S.R. Bridges, 1988. Dietary fiber of selected foods. Am. J. Clin. Nutr., 47: 440-447. Anhwange, B.A., V.O. Ajibola and S.J. Oniye, 2004. Chemical studies of the seeds of Moringa oleifera (Lam) and Detarium microcarpum (Guill and Sperr). J. Biol. Sci., 4: 711-715. Anwar, F. and M.I. Bhanger, 2003. Analytical characterization of Moringa oleifera seed oil grown in temperate regions of Pakistan. J. Agric. Food Chem., 51: 6558-6563. Anwar, F., M. Ashraf and M.I. Bhanger, 2005. Interprovenance variation in the composition of Moringa oleifera oilseeds from Pakistan. J. Am. Oil Chem. Soc., 82: 45-51. Aslam, M., F. Anwar, R. Nadeem, U. Rashid, T.G. Kazi and M. Nadeem, 2005. Mineral composition of Moringa oleifera leaves and pods from different regions of Punjab, Pakistan. Asian J. Plant Sci., 4: 417-421. Atasie, V.N., T.F. Akinhanmi and C.C. Ojiodu, 2009. Proximate analysis and physico-chemical properties of groundnut (Arachis hypogaea L.). Pak. J. Nutr., 8: 194-197. Bhagya, S. and M.C. Shamanthaka Sastry, 2003. Chemical, functional and nutritional properties of wet dehulled niger (Guizotia abyssinica Cass.) seed flour. Lebensm. Wissen. Technol., 36: 703-708. Bishnoi, S. and N. Khetarpual, 1993. Variability in physiochemical properties and nutrient composition of different pea cultivars. Food Chem., 47: 371-373. Bozan, B. and F. Temelli, 2008. Chemical composition and oxidative stability of flax, safflower and poppy seed and seed oils. Bioresour. Technol., 99: 6354-6359. Dunford, N., 2008. Oil and oilseed processing I. Food technology fact sheet, FAPC. Oklahoma State University, http://www.fapc.biz. EIAR, 2003. Importance of Moringa stenopetala. Ethiopian Institute of Agricultural Research, http://www.eiar.gov.et. Eilert, U., B. Wolters and A. Nahrstedt, 1981. The antibiotic principle of seeds of Moringa oleifera and Moringa stenopetala. J. Med. Plant Res., 42: 55-61. Fahmi, M.R., N.W.A.Z. Najib, P.C. Ping and N. Hamidin, 2011. Mechanism of turbidity and hardness removal in hard water sources by using Moringa oleifera. J. Appl. Sci., 11: 2947-2953. Foidl, N., H.P.S. Makkar and K. Becker, 2001. The potential of Moringa oleifera for agricultural and industrial uses. Proceedings of the International Workshop: What Development Potential for Moringa Products? October 29-November 2, 2001, Darussalam, Tanzania, pp: 1-20. Jahn, S.A.A., 1991. The traditional domestication of a multipurpose tree Moringa stenopetala (Bak. F.). Cuf. in the Ethiopian Rift Valley. Ambio, 20: 244-247. Jahn, S.A.A., H.A. Musnad and H. Burgstaller, 1986. The tree that purifies water: Cultivating multipurpose Moringaceae in Sudan. Unasylva, 152: 1-6. Lalas, S., J. Tsaknis and K. Sflomos, 2003. Characterization of Moringa stenopetala seed oil variety Marigart from island Kokwa. Eur. J. Lipid Sci. Technol., 105: 23-31. Lalas, S., O. Gortzi and J. Tsaknis, 2006. Frying stability of Moringa stenopetala seed oil. Plant Foods Hum. Nutr., 61: 99-108. Manzoor, M., F. Anwar, T. Iqbal and M.I. Bhanger, 2007. Physico-chemical characterization of Moringa concanensis seeds and seed oil. J. Am. Oil Chem. Soc., 84: 413-419. Mayer, F.A. and E. Stelz, 1993. Moringa stenopetala provides food and low-cost water purification. Agroforestry Today, 5: 16-18. NRC, 2006. Lost Crops of Africa, Volume II. Vegetables. The National Academies Press, Washington, DC. Pages: 378. Oliveira, J.T.A., S.B. Silveira, I.M. Vasconcelos, B.S. Cavada and R.A. Moreira, 1999. Compositional and nutritional attributes of seeds from the multiple purpose tree Moringa oleifera Lamarck. J. Sci. Food Agric., 79: 815-820. Paliwal, R., V. Sharma and Pracheta, 2011. A review on horse radish tree (Moringa oleifera): A multipurpose tree with high economic and commercial importance. Asian J. Biotechnol., 3: 317-328. Shkelqim, K., H.R. Mendoza and M. Joachim, 2008. Physical, mechanical and chemical properties of Jatropha curcas L. seeds and kernels. Proceedings of the Conference on International Agricultural Research for Development, October 7-9, 2008, Stuttgart-Hohenheim, Germany, -. Somali, M.A., M.A. Bajneid and S.S. Al-Fhaimani, 1984. Chemical composition and characteristics of Moringa peregrine seeds and seeds oil. J. Am. Oil Chem. Soc., 61: 85-86. Sutherland, J.P., G.K. Folkard and W.D. Grant, 1989. Seeds of Moringa species as naturally occurring flocculants for water treatment. Sci. Technol. Dev., 7: 191-197. Yisehak, K., M. Solomon and M. Tadelle, 2011. Contribution of moringa (Moringa stenopetala, Bac. ), a highly nutritious vegetable tree, for food security in South Ethiopia: A review. Asian J. Applied Sci., 4: 477-488.